External doors are the ideal entrances for criminals. All of your possessions went through one at some point. So a criminal knows that’s the best way to get them out. There are many ways to improve the security of your external doors. It is possible to make an entrance virtual impenetrable. It would not be worth the time and effort for a criminal that is already in a hurry. Most upvc and composite doors have a multi-point locking system that operate the hooks or rollers. Your standard cylinder is vulnerable for lock snapping. There is a way of protecting your property against snapping. That is by using the highest approved cylinder available the Avocet ABS High Security Euro Cylinder is recommended by Keywise and also the police. Locks are the most obvious way of protecting the entrance ways. There are locks now that are near enough impossible to pick, snap, bump or drill. For even the most experienced locksmith it is even still a very impressive feat. As a lock replacement the “Avocet ABS (Avocet Break secure) High Security Technology Euro Cylinder” is the lock we recommend at KeyWise. Just watch video below to get a full description of the lock. Avocet ABS 3 star TS007 is rated a Diamond High security lock for anti-snap/ anti-bump/anti-drill/anti screw. This is why the abs TS007 cylinder is the only police preferred cylinder in the uk. It’s packed full of high security features making this the uk’s highest accredited cylinder. Mortice looks are available with latches, deadbolts or a combination of the two known as a sash locks . These locks are very common and very effective. many people think they have bought a bargain but we have rescued many people with fake mortice locks, many of the mortice locks have been brand new one turn of the key and the owner has been in trouble either locked in or out but the real danger of this is, what happens if there is a fire ? Yes a very dangerous situation This is why it is very important to look for the British standard kitemark stamped on the faceplate of the mortice lock. As the BS 3621 locks have stood up to high security testing including anti drill and anti picking of the lock, if your locks are not complying with the BS 3621 standard your insurance company may not pay out in a attack from a burglary. If you are not sure if your locks are set at this standard, Keywise offer a free security check for your property or business. We will use our wide knowledge as a security company to assess if your locks meet the british insurance policy standards. FREE OF CHARGE. Here’s a video of an insurance approved, 5 lever mortice lock. Night latch looks are designed so they can be left ‘on the latch,’ so the door can be shut and left unlocked. Fitted correctly the night latch can be a very secure lock. Fitted incorrectly it can be a point of weakness for anyone that understands the principles behind the mechanism. That’s why it’s important to get a profession to fit any locks to be sure that it’s all safe and secure. 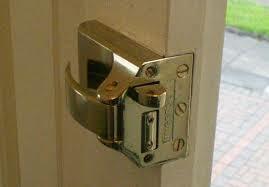 The nightlatch is certificated to BS 3621 for insurance purposes. They also come in a variety of styles and sizes. Nightlatches can also be non-deadlocking and Key Deadlocking, that means you can deadlock the latch with a turn of the key to prevent the latch being slipped. When you get a knock the door, it is always best to get a look at who is on the outside. There are robberies all over the world happening everyday. They happen where the home owner lets the criminal in without any suspicion. The cheapest option is the traditional magnified door viewer allowing you to view 180 degrees through the lens and enabling you to see who is on the other side of your door, it is easily installed by a professional, its aesthetically pleasing as well. The digital door viewer also known as the electric eye is surprising affordable, its a very good option for the elderly and very simple to use and it takes just one button to press to operate, It appears exactly the same from the front as the traditional door viewer but gives a clearer less distorted image than the magnified lens of the traditional viewer. 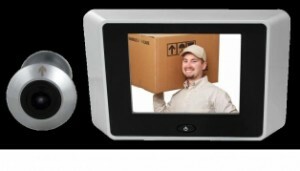 T\he image is displayed on a monitor on the back of the door , just as in the picture below.